The Army National Guard and the Air National Guard form a militia and military, federal reserve force. The Army National Guard is divided into subordinate units with reservists stationed in each of the 50 states, three territories, and the District of Columbia. They each operate under their respective governors. This Army National Guard job is categorized as military occupational specialty (MOS) 79T. Like civilian company recruiters do for private companies, soldiers in MOS 79T work to find the best talent for the Army's needs. Their duties include prospecting and refining leads, and determining whether a potential recruit is eligible for enlistment. It may involve helping them to pre-qualify for enlistment, or investigating whether someone is eligible for reenlistment. Some recruiters in the Army National Guard develop and conduct recruiting events at schools. For any new or potential recruit, it's up to the recruiting and retention NCO to explain such incentive programs as the Montgomery GI Bill, and any initial entry training requirements. Another part of this job involves developing media contacts, to help publicize any recruitment efforts or events, and developing talking points for interviews, so first line leaders can accurately answer questions. They'll write scripts for ads and marketing copy, and will also oversee direct mail campaigns, much like any civilian marketing executive would. And of course, they'll oversee the marketing and advertising budget. 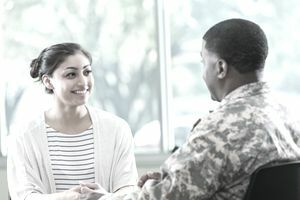 In addition to bringing new personnel into the Army, the recruitment and retention specialists reviews requests for separation, transfer, and discharge, and reviews any necessary procedures related to these requests with the soldier in question. To qualify for MOS 79T, you'll need a 100 in the general technical (GT) aptitude area of the Armed Services Vocational Aptitude Battery (ASVAB) tests. It is waivable to a score of 100 if you also score 100 on the skilled technical (ST) area of the ASVAB. There is no Department of Defense security clearance required for this job, but you must have either a high school diploma or one year of college and a high school GED. You have to have a record free of any convictions of sexual offenses, either in special or general courts-martial or civilian court. These are outlined in AR 27-10 the Military Justice code, under chapter 24. You'll be well positioned for careers in marketing, advertising, and recruitment at civilian companies, and may be able to pursue jobs in human resources departments as well.